So, you're a non-baseball fan, you quite liked (or at least were interested in) Moneyball and you're looking for something further, which manages to be 'baseball' but without all the, you know... baseball. Well, extremely niche group of people, Eight Men Out may be the film for you. Like Moneyball, Eight Men Out spends precisely diddly-squat of its runtime trying to show the sport in question, mainly because it knows it can't. The few glimpses of games look dated and poorly dramatised and don't capture the excitement of the sport. The focus instead is on the off-the-pitch quandary (or not) of the players of the 1919 Chicago White Sox, who were part of a plan to throw that year's World Series, making a huge amount of money for a variety of professional gambling backers. Based on the non-fiction account of the ordeal, John Sayles film makes a good fist of exploring the more complicated elements of the thought process behind throwing away the greatest prize in your sport. The team were, perhaps, too good for their own good. They were underpaid by tight-fisted owner Charles Comiskey (Clifton James) and the league did little to stem the flow of illegal interests in baseball at the time. Sayles also teases out the justifications and defences Eliot Asinof detailed in the book; a pitcher is cajoled into his part in proceedings via threats and intimidation, another only so he get the money Comiskey had originally promised him, a further two only because they don't want to rat out their team mates. The morals and reasons behind the scandal are labyrinth and the director makes a good fist of translating Asinof's sympathies and criticisms to screen. The problem is that Asinof's book wasn't a drama and Sayles' film realises too late in the affair that it needs to correct this in order to work as more than historical artifact. Buck Weaver (John Cusack) and Shoeless Joe Jackson (D.B. Sweeney) emerge far too late on as the good-guy focuses we're meant to root for and Sayles never gets close to showing us what is at stake for both of them until the final scene, which still manages to be subtly touching. It's also a film lacking an ultimate villain. Rothstein (Michael Lerner) is nowhere near evil enough and Michael Rooker is only his typical rent-a-badguy. 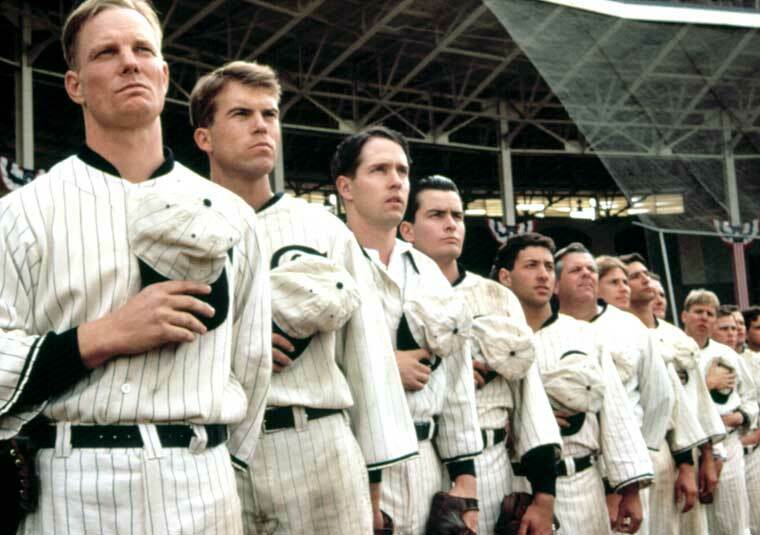 Eight Men Out is iconic to some but it's also a film that could be improved upon and wouldn't be diminished or marginalised if someone was to update things. Good 'further reading' for those impressed by Moneyball (especially as today is the opening weekend of the 2012 baseball season) but a remake of the same source now, with some major talent involved, could really turn up something remarkable.